Ginger was a miracle baby. She was badly twisted in the uterus and our Vet managed to fish her out alive. She was very weak at birth and unable to stand or nurse. The photo below is taken at one day old. She required lots of tender loving care for the first three days of her life. She is lucky to be alive..........thus her name is Lucky Lil Ginger. Ginger is very correct, with awesome straight legs. She is a bay pinto in her natural coat, much darker when cliipped; the summer also brings out a hint of buckskin in her pedigree. Ginger was a participant in our 4-H club prior to becoming a broodmare. 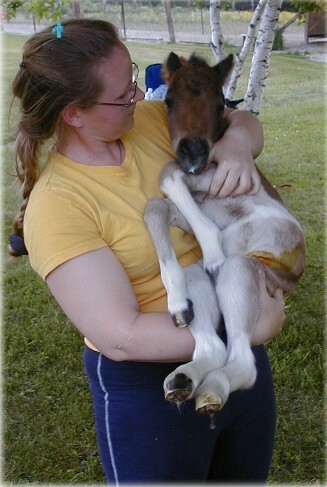 She has produced show quality foals. She is currently bred to Strongs Prince Reno for a 2014 foal. We will offer for Ginger for sale with only as a breeding pair with Strongs Golden Chianti JR . New photos coming soon. Ginger is a participant in our Haldimand County Miniature Horse 4H Club.